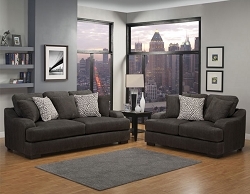 Sofa and love seat in this section can be custom with the fabric of choice. Images showing our most popular fabric choice for the style. You may choose to place an order as shown in the picture or other fabric choice available to the set. If you have other requirement for customization please email us, we'll do our best to accommodate your designing needs.